Collaborative Consumption Various materials on wood panels with resin 84 in. x 3 in. 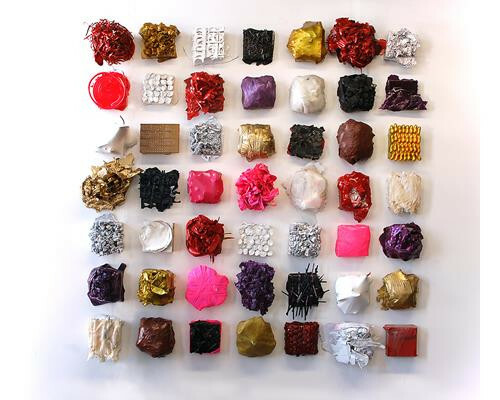 Heaven’s Directives #2 Recycled packing materials, resin and enamel on panel 92 in. x 70 in. Eruption Beeswax, oil, asphalt, enamel on canvas 60 in. x 84 in. 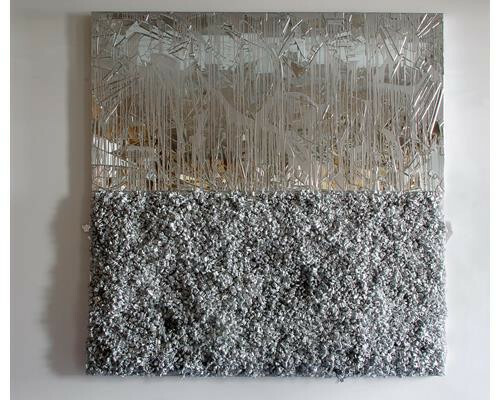 Mirror And Nuggets Packing peanuts, enamel, hand-cut mirror, resin on panel 90 in. x 90 in. Parallel Lines Never Intersect No. 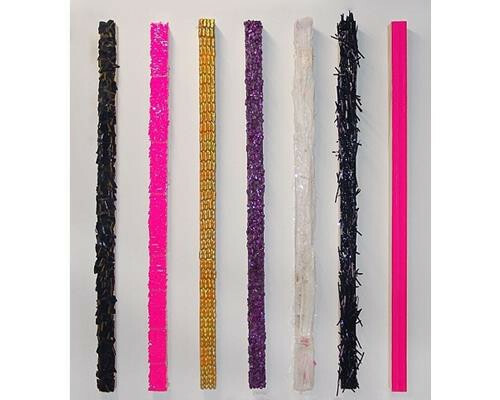 1 Recycled tape, enamel, glue, resin on panel 36 in. x 48 in. Parallel Lines Never Intersect No. 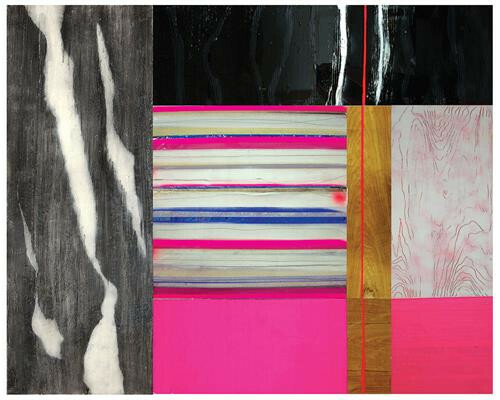 3 Recycled tape, enamel, glue, resin on panel 48 in. x 60 in. 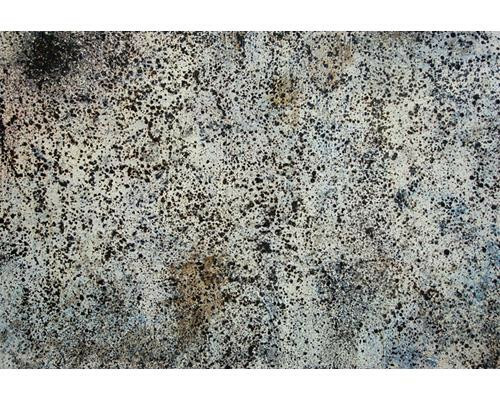 Particles Of Her mixed media, resin on panel 78 in. x 78 in. 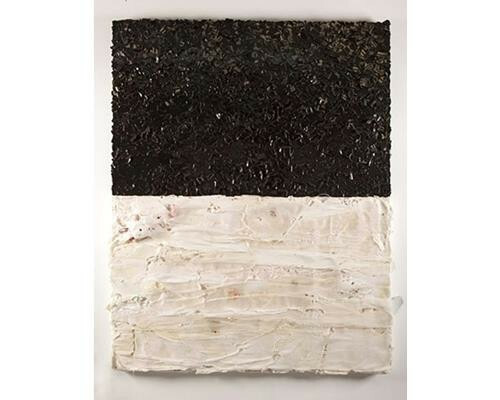 Tar And Mirror Roofing paper, enamel, resin and hand cut mirror on panel 90 in. x 90 in. Connie Noyes is an inter-disciplinary artist whose work examines the social constructions of idealized beauty and the values assigned to it through transformative processes. 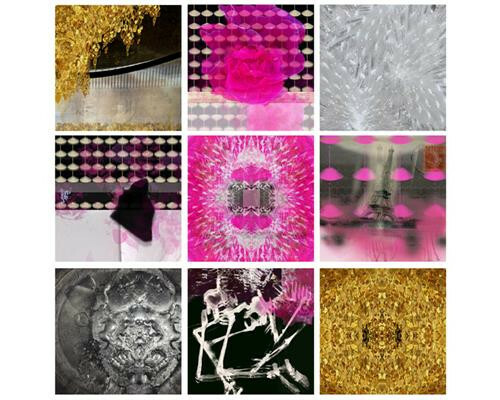 Her work provokes the question: what constitutes beauty? 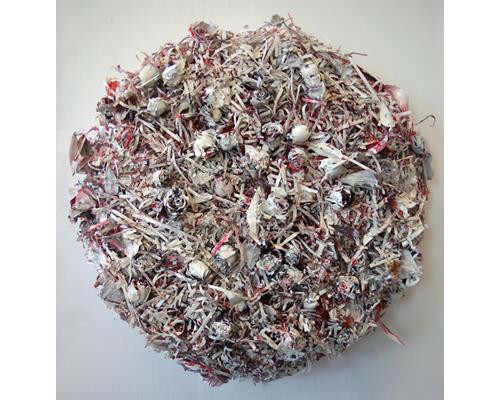 Noyes gathers everyday objects, debris from her studio, polystyrene from the community dumpster, roofing paper and junk food such as Bazooka Joe and marshmallows, which she then reconstitute into metamorphic, organic forms. 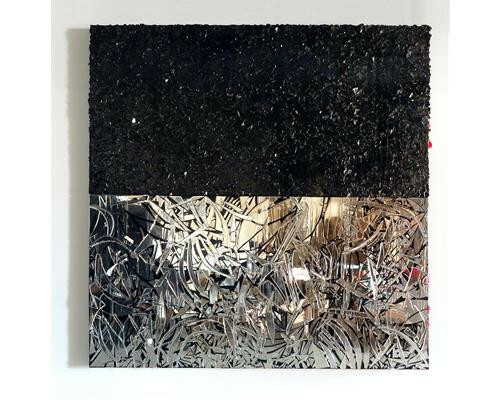 The materials, manipulated, torn, burned, wrapped or crushed, are then embellished with chrome, steel, gold leaf, enamel paint and resin. The resin coating captures the energy and experimentation in a final layer of the production process, transforming what was once discarded and of no value into a valuable, seductively beautiful object alive and rich with texture. Born in Washington D.C Connie Noyes is a full-time artist, who after 50 life-time moves, currently lives and works in Chicago. She received her MFA from the School of the Art Institute of Chicago and MA degree in Psychology from Notre Dame de Namur University in Belmont California. In 2007 she was awarded the Al Smith Fellowship from the Kentucky Arts Council and has received numerous professional development grants. Her work has been exhibited both nationally and internationally in places such as San Francisco, Paris and Innsbruck, but most recently in a solo exhibitions at N’namdi Contemporary in Miami and the Noyes Cultural Center in Evanston, IL, an exhibition titled “No Relation.” She has been selected for numerous international artist’s residencies, some of which include the Emaar International Art Symposium in Dubai, United Arab Emirates (2005); Thupelo International Workshop in Cape Town, South Africa (2005); the 6th Annual International Symposium of Art in Bulgaria (2006) and the 5th International Visual Arts Symposium in Monastir, Tunisia (2007). 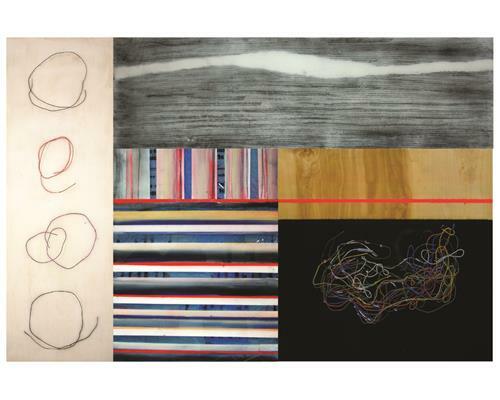 Noyes’ work is also in a number of corporate, private, and museum collections including that of, Neimen Marcus, Emaar International in Dubai and the Greenville County Museum.